If your home exterior has been finished with stucco coating, you’re in luck! Not only is this long-lasting, durable material attractive, it can also effectively protect your home against the elements. But, just like other types of house siding, the color of your stucco can fade over time. When this happens, you may wonder if you can paint the stucco on your home. With proper preparation, the right paint, and correct painting materials, exterior stucco painting can offer many benefits. Stucco is one of the most popular exterior finishes for homes as it is low-maintenance and can look beautiful for years when taken care of. Hiring professional painters to paint your stucco can ensure the following unique advantages. After it rains, you may notice that your stucco absorbs water and becomes darker until dry. When you paint stucco, the paint completely seals the material, so moisture won’t penetrate it. This allows your color to remain consistent even during a very rainy day. While it’s true that stucco is well-known for absorbing moisture, painting stucco with the right paint can ensure it stays waterproofed and damp spots are kept at bay. Paint manufacturers have developed special exterior painting systems for stucco in order to make it even more weather resistant. Preventing moisture from entering stucco can help your home maintain an attractive appearance for many years. You probably see water and rusting stains running in vertical lines on your stucco (usually beneath window frames). Painting stucco can block and cover these stains. When painted by professionals, stains won’t reappear for years on the new paint surface! Do you have a lot of cracks in your stucco? This damage will only become a bigger problem with time. When left unpainted, chunks of stucco will pop out and costly repairs will be needed. Painting your home with high-quality thick paint can fill these hairline cracks naturally with the paint film. It’s important to note that professional painters will need to fill larger cracks in stucco with exterior caulk or masonry patching prior to painting. Because stucco is porous, and the crack filler needs to be flexible, caulking a large crack won’t blend perfectly. But, this process will help the crack blend a lot better with the paint color and help it look much better! The best way to make a stucco home stand out on the curb is by refreshing it with fresh coats of paint. Whether you are in the market to sell your house, or just want to keep your home looking great for generations, painting stucco is a simple solution for improving the appearance of your exterior walls. The right stucco paint can speak to your visitors, homebuyers, and neighbors as it creates an extremely attractive, classic look that stands the test of time. If you live in a hot, sunny climate, ultraviolet rays can reduce the durability of your exterior stucco which can lead to structural damage and cracks in masonry. When structural changes occur, they greatly impair the functionality of stucco. Painting your stucco helps keep exterior walls properly insulated and protected by deflecting damaging UV rays. A flat, eggshell, or satin paint finish. A regular two (2) coat exterior paint process (sometimes a primer and top coat). Elastomeric coatings, which are very flexible and can stretch. How Often Does Stucco Need Painting? While stucco is a very durable surface, it will need to be repainted periodically – but not often. Proper application using high-quality paint can help your stucco last over 20 years without peeling or blistering, but its longevity also depends on environmental factors. It’s important to inspect your stucco every couple of years to determine when you may need to repaint it. As soon as you see paint starting to peel off stucco, it’s critical to apply fresh paint to ward off moisture or structural damage to masonry. 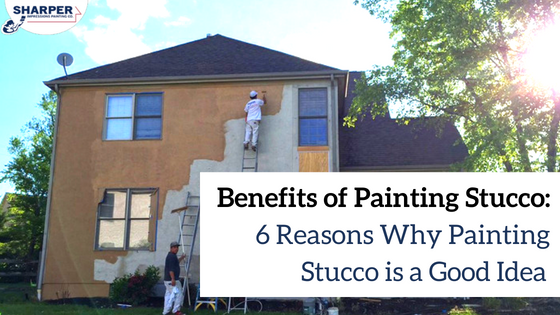 Painting stucco on your home can offer a wide range of benefits, but only if the project is completed correctly. You can ensure that your stucco is painted properly by trusting your home to experienced stucco painters who know exactly what type of paint to use, can suggest the perfect paint colors, and consistently deliver high-quality results that last for years. If you’re ready to refresh your home with a fresh coat of stucco paint, request a free exterior painting quote today!